a practice of thoroughly cleaning your home from top to bottom. But are you cleaning it as good as you can? This checklist has everything you need to know about Spring Cleaning. So if you want your family breathing cleaner air, reduce harmful allergens and be safe, you're in the right place. Today I’m going to show you exactly how to do it (room-by-room). 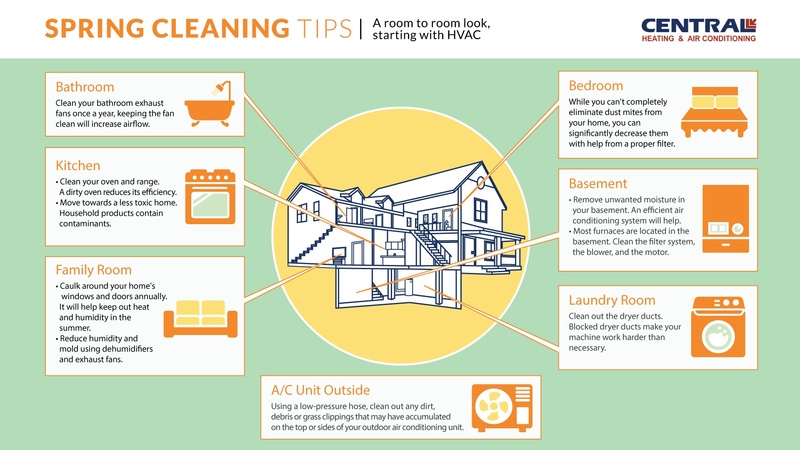 This isn't your typical spring cleaning you might have in mind but you should know it all begins with your HVAC. According to CPSC (Consumer Product Safety Commission), "In the last several years, a growing body of scientific evidence has indicated that the air within homes and other buildings can be more seriously polluted than the outdoor air in even the largest and most industrialized cities." 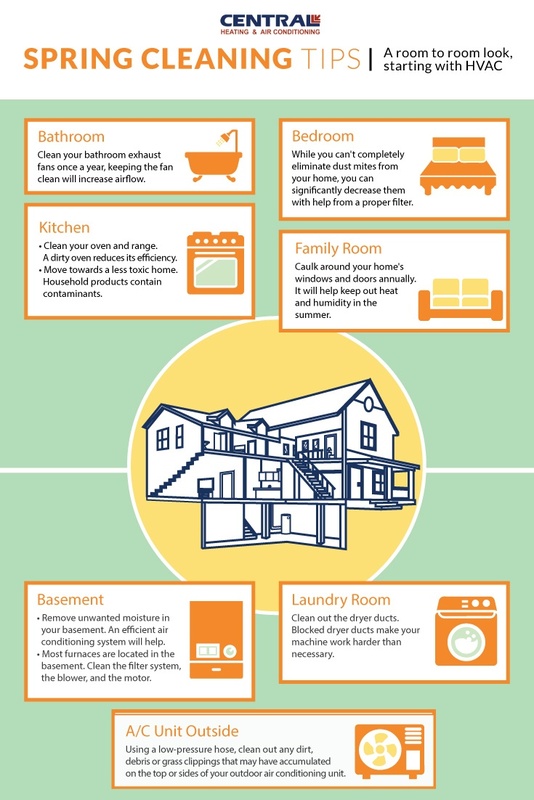 In light of the new season, we thought we would create an infographic (a go to checklist) to have your home sparkling and your lungs thanking you. Spring cleaning should become a tradition in your home. you need to follow this handy image created by Remodelaholic. Allergens/dust mites collect in pillows and bedsheets, which can be harmful and trigger allergies and asthma. Vacuum regularly to reduce dirt and dust mites. No matter how clean you think your home is, those pesky microscopic "relatives of the spider" exist. They can be found on your bedding, carpets, drapes and upholstered furniture. 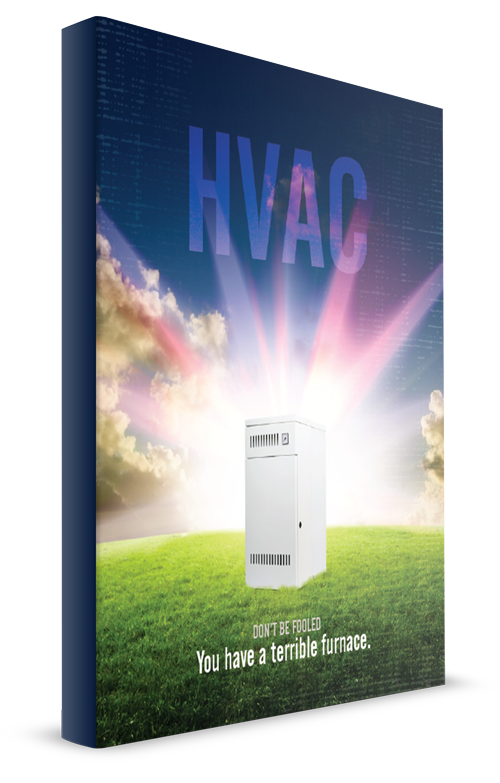 What can your HVAC system do to help eliminate those pesky creatures? Here's where you need to step up your spring cleaning. Don't forget about your air filters. While you can't completely eliminate dust mites from your home, you can significantly decrease them with help from a proper filter. Clogs contribute to unhealthy air: "A clogged air filter will allow all that dust and debris that should be filtered out to be re-circulated back into your home. This can cause chronic allergies and especially be dangerous for people with asthma or other respiratory conditions." Start by changing your air filters regularly. Install a high efficiency filter in your furnace and air conditioning unit. Look for a filter with a MERV value of 11 or 12. "Did you know that tile grout has spores, just like skin? That's why cleaning bathroom tile grout can be tough. Rightathome shares the ultimate video guide to clean your bathroom tile. Clean your bathroom fans once a year. Take the cover off, wash it in soapy water and clean dirt off the fan blades with a toothbrush. Don't forget to turn the power off first. Any time you can remove visible dirt, your system will run more efficient. Keeping the fan clean will increase airflow. Clean & Scentsible also shares a cleaning checklist to get your bathroom ready for the spring. Every one gathers in the kitchen, right? So naturally you want it Clean. Plus you cook your food there! Clean your oven and range. A dirty oven reduces its efficiency. What else should you be concerned with in your kitchen? Household products that contain contaminants. Aerosol sprays, air fresheners, hobby supplies can all trigger health issues such as chronic lung disease and asthma. Our friends at Keeper of the Home did an outstanding job on How to get started with their Go-to-Guide to move towards a less toxic home and lifestyle. Probably one of the most used rooms in the house, you don't want to miss doing a great job here. Just like in the pillows and bed sheets, those pesky dust mites can thrive in carpets. Vacuuming removes surface dust but can’t remove most dust mites and dust mite allergens. Mites are tiny enough to pass through the vacuum cleaner bag. However, vacuuming keeps dust down so these areas aren’t as attractive to mites. Get underneath and behind furniture to keep "dust bunnies" from forming. "Caulk around your home's windows and doors annually. Think of spring as a time to do this. 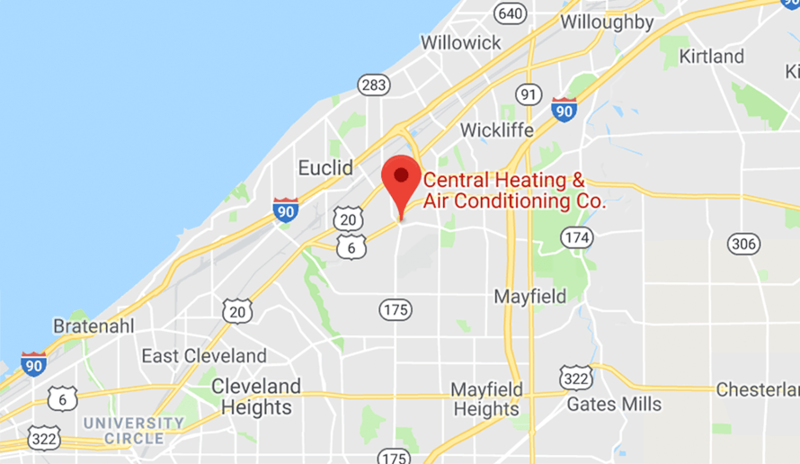 That will help keep out heat and humidity in the summer and cold drafts in the winter—and save money on your utility bills all year round." Manage your humidity levels. Reduce humidity and mold using dehumidifiers and exhaust fans. If you have ceiling fans, run them counterclockwise. This way, the airflow produced creates a wind-chill effect, making you "feel" cooler. The laundry room is one of those rooms that are used often but at times we figure we can just close the door and hope for the best. 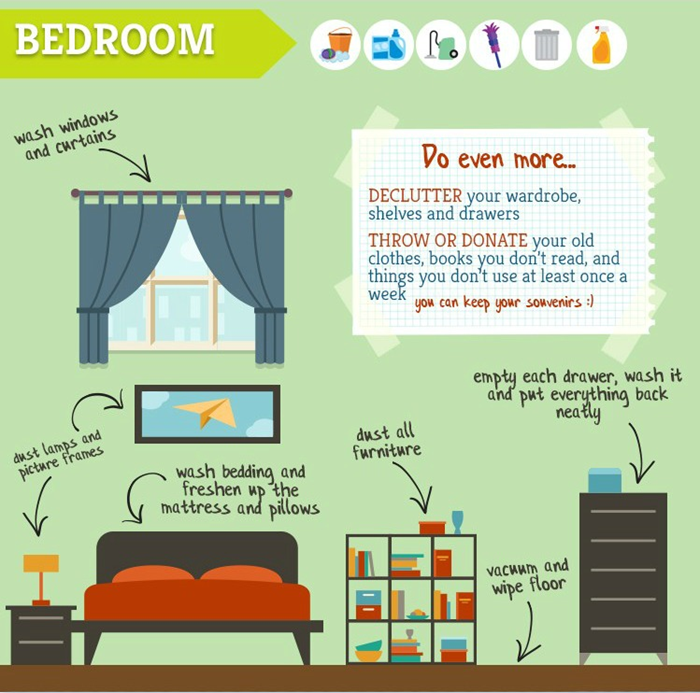 Spring time is the best time for that fresh start to declutter and organize this busy room. Coming from the HVAC side of things, I think about cleaning out the dryer ducts. Blocked dryer ducts make your machine work harder than necessary. As we said we want your home running as efficient as possible. 1. Make sure you unplug your dryer. If you have a gas dryer, turn the gas off. 2. Loosen the vent clamp on the back of the dryer. 3. Slide the vent off the dryer. 4. Reach into the hole on the back of the dryer, and pull out any lint and buildup. 5. The vent tubing should be cleaned as well. Most of the lint builds up towards the end. For more on how to clean the vent on the outside of the house read Clean a Clothes Dryer. Being diligent about cleaning your lint screen is awesome but small fibers can get through the trap and into your dryer vent. To address problems in your home humidity levels, you may need additional equipment, such as a whole home ventilation system or a humidification system. These systems are designed to increase your home comfort and decrease your risk of humidity related health issues. Most furnaces are located in the basement. Clean the filter system, the blower, and the motor. Most furnaces should be properly maintained. Fall is actually the best time to perform an annual inspection. A yearly furnace inspection can prolong the life of your HVAC system and save on your energy consumption. If unsure how to handle, consult a professional. Get your air conditioner in top working condition before the hot season kicks in. Your air conditioner will function much better without a year's worth of dirt and debris. Clean the area around the unit. Using a low-pressure hose, clean out any dirt, debris or grass clippings that may have accumulated on the top or sides of your outdoor air conditioning unit. Debris blocks the proper airflow and will reduce your unit's cooling ability. Check the drainage hole on the base of the cabinet located beneath the evaporator fins. This hole needs to be kept clear in order for the air conditioner to work properly. Family Handyman goes through a step by step guide to cleaning your air conditioner unit. Always a good tip is to call for service before the first heat wave hits. Schedule a maintenance appointment. Have your home checked annually by HVAC technician. 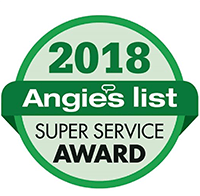 While these tips will help keep your HVAC system running smoothly, be cautious that there are maintenance items only trained technicians should handle. A spring spruce up will have your home working its best. Spring cleaning is an important part of owning a home. 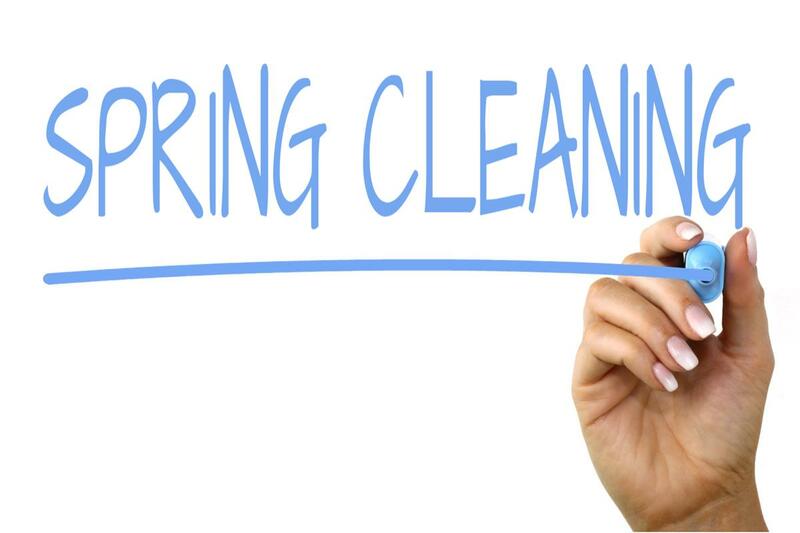 The spring cleaning checklist will improve your comfort and overall efficiency of your home.